Copper levels at Shelter Island Yacht Basin, already reduced by 40 percent, must meet 76 percent reduction by 2022. SAN DIEGO — Reducing the copper load at Shelter Island Yacht Basin has been progressing according to plan, Port of San Diego staff told commissioners, June 20. Meeting the regional and state water quality board mandates in the final five years of the basin’s Total Maximum Daily Load (TMDL) program, however, could prove to be the most difficult stretch of the mandated 15-year process. A regional water board order called for the port district to reduce copper loads at Shelter Island Yacht Basin by at least 76 percent by 2022, according to a TMDL program update at the June 20 Board of Port Commissioners meeting. Port district staff informed commissioners the quasi-judicial agency had met its 2017 goal to reduce copper levels at Shelter Island Yacht Basin by 40 percent, when compared to 2007 levels. The 40 percent reduction mandate was the third phase of a four-stage TMDL compliance schedule established by the regional water quality board. Stages 1 and 2 began in 2007 and 2012, respectively; the TMDL compliance schedule only required a 10 percent reduction in copper by 2012. The fourth and final stage begins in 2018 and continues through 2022; the port district must have achieved a 76 percent reduction in copper pollution at Shelter Island Yacht Basin by 2022. “Due to the efforts of the boaters, the marinas and our staff we’ve been able to meet both the 2012 and, so far, the 2017 targets. But … the last few years have leveled off some, which means if we’re going to get to the final compliance period, more efforts will be necessary,” Holman said. Commissioners commended port district staff for meeting the 2017 mandate for copper reduction, but acknowledged compliance with the 76 percent reduction goal could prove to be the most difficult phase of the TMDL program. The port district proposed building a new draining and piping system, or culvert, to help meet the 76 percent mandate in the final two years of the TMDL program. Building a culvert would cost the port district about $6.5 million, according to official documents – which prompted Malcolm to ask whether installing a new drain and pipe system would achieve the 76 percent copper reduction mandate by 2022. “We need to do more analysis,” Holman told commissioners, adding the $6.5 million expenditure for a culvert would be initiated in 2021 and allow the port district enough time to determine whether the new infrastructure would help meet or exceed the 76 percent mandate ahead of the 2022 deadline. Port district stated water quality is tested annually and vessels are monitored for conversions from copper to non-copper hull paints. The TMDL program, in an effort to reduce copper levels, is made up of five concurrent elements: policy development and legislation; testing and research; hull paint transition; education and outreach; and, monitoring and date assessment. The EPA awarded the port district a grant in 2008 to study copper paint alternatives. One year later the port district began using only non-copper paints on its entire fleet of vessels. 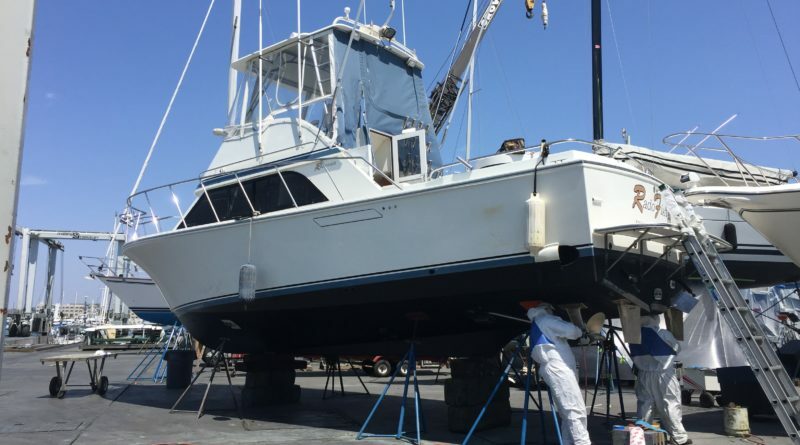 A statewide mandate prohibiting certain new or currently registered anti-fouling copper paints on recreational vessels is set to go into effect July 1, 2018. Anti-fouling copper paints for commercial vessels would be exempted from the prohibition. If copper paint is so bad, why is anyone exempt? Exempting a class of boaters from paint mandates is almost as silly as Marina Del Rey targeting hull cleaners to attack less then 10% of the issue.